FRISBI (French Infrastructure for Integrated Structural Biology) is a National Infrastructure in Biology and Health, which provides the academic and industrial community with access to technologies and know-how dedicated to integrative structural biology. offers courses in structural biology integrated with post-master researchers.  Coordinated by Bruno Klaholz (IGBMC, Strasbourg), FRISBI is divided in 5 regional nodes: Strasbourg, Grenoble, Montpellier, Marseille et Paris-Sud. Research Team of the Frédéric Joliot Institute for Life Sciences font take part in Paris-Sud node.